Cut shapes and cutting methods have evolved throughout history, depending amongst others on factors such as current technology in the area and fashion taste. It is reasonably hard to give precise chronological measurements because there are not many diamonds and gemstones left from the middle ages and before. Throughout time, many gemstones have a history of being taken out of their jewel, re-cut and put into another jewel. Through analyzing archive materials, inventories, paintings old manuscripts, more details could be given, but much of it would be estimates and guesses. Without making any guesses, there are some things we can very accurately tell about the history of gemstone cutting. Up until the 1'th century carbon cutting was the main technique used. We do not know exactly when it originated. It was mostly used for cutting transparent or semi-transparency diamonds and gemstones. In those times standard cuts were not yet famous or popular and not much regard was put on the shape on the stone, the cutting instead focussed on removing any rough edges or very obvious imperfections on the outer layer with an irregular shape as a result. The table cut was the most popular cut during the 14th, 15th and 16th century. Cheaper gemstones have a much higher probability of being re-cut throughout history because cutting always involves a risk that the gem will break and almost all value will be lost. More expensive stones are also more scarce, thus making whatever gets cut even more value reducing in terms of total weight in comparison to cheaper stones. Diamonds, for example rarely get re-cut. Much time and often discussion amongst professionals is spent on finding the ideal shape from a diamond. This is not the case with cheaper stones. Carbon cutting was very effective at shaping the diamonds and giving it a nice shine, but the surfaces were not smooth and reflective, which is the case of the current day method of facet cutting. The invention and refinement of cutting methods is the reason we have the beautiful sparkle and reflections we know today. The cutting method that truly justifies the beauty of gemstones started around the 14th century. The development of this cutting method was intertwined with the diamond cutting sector. 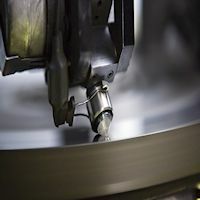 Facet cutting involves a large disc spinning around horizontally. Once this method started to be used it was further refined, including faster spinning speed and material of which the disc is made of. Diamond and gemstone cutting techniques are still evolving to this day, with the sectors investing much time and money in its development. By the 15th century over 200 different variants of facet cutting were being used based on the original method. The refinement of this technique led to far more facet cutting in gemstones and diamonds, which led to the popularity of common cut shapes we have today. The first recorded instance of the brilliant cut, which is the most popular cut today dates back to the 17th century. Diamonds are cut in several stages, the first being in its roughest form. Sometimes a small window is cut into the diamond to test its quality. Before the final plan on the ideal cut is decided upon, special equipment is used to measure the exact size and proportions of the diamond and transfer that to a digital 3D rendering program. 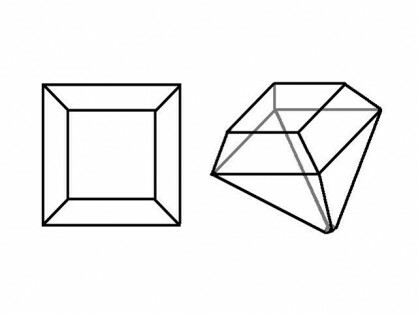 This is done in order to visualize the diamond and the potential shapes one can get out of them. The goal is to get as much possible money from the stone, keeping as much possible value. If there is potential for a stone of exceptional quality, such as imperfections on the outer layers exceptions are made and the highest value is concluded to be for a smaller diamond but of higher clarity. Almost all of the diamond cutting is done manually. 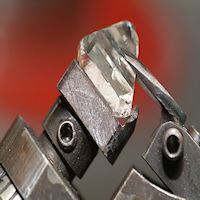 They attach the diamond to an object called a "dop", which holds the diamond and enables the diamond cutter to properly aim the angles which are rubbed against the spinning disc. The distance created by the dop between the diamond and the hand also greatly increases the safety of diamond cutting, as the hand can be placed a safe distance away from the disc. After the desired result on one of the surfaces has been achieved, the stone is inserted back into the dop in a different position and the process is then repeated. Stones cannot be cut indefinitely. The gem must cool off after being cut for a few minutes due to it heating up. Once this happens, and it happens frequently the cutter has to wait for the gemstone to cool off. Depending on the material of the stone, it can take days, weeks for the gemstone to be cut. In some cases it can even take months.